The Lord Nelson class was a two-ship class of pre-dreadnought battleships built by the Royal Navy between 1905 and 1908. Although they were the last British pre-dreadnoughts, both were completed and commissioned after HMS Dreadnought had entered service. Lord Nelson and Agamemnon were serving in the Channel Fleet when World War I began in 1914. They were both transferred to the Mediterranean Sea in early 1915 to participate in the Dardanelles Campaign. They remained there, assigned to the Eastern Mediterranean Squadron, which was later redesignated the Aegean Squadron, to prevent the German battlecruiser SMS Goeben and her consort Breslau from breaking out into the Mediterranean. Both ships returned to the United Kingdom in 1919. Lord Nelson was placed into reserve upon her arrival and sold for scrap in June 1920, but Agamemnon was converted into a radio-controlled target ship before being sold for scrap in 1927, the last surviving British pre-dreadnought. The Lord Nelson-class battleships were designed and built at a time when the direction of future battleship construction was controversial. On the one hand, naval combat during the Russo–Japanese War of 1904–1905 suggested that engagement ranges would increase to the point that intermediate and secondary batteries would become far less important and perhaps even ineffective, and that smaller-calibre guns would be useless in combat between capital ships; on the other hand, the lower rate of fire of battleship main batteries raised questions about the prudence of building all-big-gun battleships, for fear that they might be overwhelmed by the higher rate of fire of intermediate-calibre guns in the shorter-range engagements that might occur in fog or bad weather or at night. In the end, the all-big-gun battleships, which became known as dreadnoughts after the first such ship, Dreadnought, were vindicated, but this was by no means clear when the Lord Nelsons were designed in 1904 or even by the time they were laid down in 1905. Agamemnon has her 12 inch (305 mm) guns replaced at Malta in May–June 1915. The Lord Nelsons were the first battleships for which Sir Phillip Watts was responsible. Although they followed the pre-dreadnought pattern established in the Royal Sovereign-class battleships in the early 1890s of having two twin main battery mounts, one fore and one aft, and mounted a main battery of four 12 inch (305 mm) guns, as had every pre-dreadnought since those of the Majestic-class battleships in the mid-1890s, they otherwise were a major departure from previous British pre-dreadnought designs; they might have marked a new era in pre-dreadnought design had not the rise of the dreadnoughts snuffed out the pre-dreadnought era. In order to match increases in firepower seen in foreign battleships of similar displacement, the preceding King Edward VII-class battleships had introduced a 9.2-inch (234 mm) intermediate battery into British battleships in addition to the 6 inch (152 mm) secondary battery they long had mounted, but the Lord Nelsons carried this further by mounting an all-9.2-inch secondary battery; they were the first British battleships not to mount 6 inch guns since HMS Inflexible, which joined the fleet in 1881. (The Trafalgar and Centurion classes had joined the fleet with 4.7 inch (120 mm) secondaries but had later had them replaced by 6 inch guns.) Also, the 9.2-inch battery, made up of more powerful guns than on the King Edward VII-class ships, was mounted in turrets (four double and two single) on the upper deck, rather than on the main deck in a central battery or casemates; this eliminated the problem of being unable to work the secondaries in a seaway, a problem in the many classes of British battleships with main-deck-mounted secondaries which were washed out in all but the calmest weather. The 12 inch guns were a new, more powerful, 45-calibre type. They and their turrets were the same as those carried by the revolutionary Dreadnought. Indeed, the completion of Lord Nelson and Agamemnon was delayed when their main battery guns and mountings were diverted to Dreadnought to expedite her completion in 1906. In the end, the mixed-calibre heavy armament proved unsuccessful, as gunnery officers found it impossible to distinguish between 12-inch (305-mm) and 9.2-inch shell splashes, making fire control impractical. This finding further pushed the navies of the world to move to all-big-gun dreadnought battleship designs. 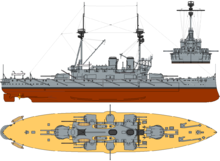 Indeed, an all-big-gun design had been considered for the Lord Nelsons in January 1905, but their design was too far advanced by then to be changed, and the all-big-gun layout had to await HMS Dreadnought. For anti-torpedo-boat defense, the Lord Nelsons retained a battery of 12-pounders. These were mounted on a large flying deck amidships, where they had a good field of fire. However, this innovative mounting scheme also was criticised because it made a good target and because in combat falling debris due to damage might foul the 9.2-inch turrets below. In addition, some officers believed that the all-12-pounder battery was too light to deal with larger, modern torpedo boats. As larger gun calibres became common in foreign battleships, it was recognised that greater protection was needed than had been thought to be the case in previous classes and so their main armour belt was twelve inches thick over the machinery spaces and magazines. The armour belt in the King Edward VII-class battleships, the immediately preceding class, was nowhere more than nine inches (229 mm) thick. The deletion of the casemate armour required for the 6 inch guns formerly mounted allowed the main belt armour to be increased at very little cost in weight. They were more heavily armoured than any other British pre-dreadnoughts, and more heavily armored in terms of area and thickness than any of the dreadnoughts prior to the Orion class (considered as the first of the "super-dreadnoughts") of 1909. They were the first British battleships to have solid watertight bulkheads, penetrated by no doors or pipes, intended to contain flooding, with access across the bulkheads being via lifts (elevators). The solid bulkheads proved unpopular in service because of the inconvenience they imposed on the crew and were not repeated in the early British dreadnoughts, although Russian experience in the Russo–Japanese War suggested that such bulkheads were useful in keeping pre-dreadnoughts from sinking. As further protection, each compartment in the Lord Nelsons had its own ventilation and pumping arrangements, eliminating the need for a single main drainage system as employed in previous British battleships and seen as a possible weakness during flooding. Lord Nelson (foreground) and Agamemnon (rear) anchored at the Dardanelles in 1915. Both ships were designed to be short because the design board responsible for the ships wanted them to be able to fit into dry docks otherwise closed to previous battleship classes. The design requirements this imposed made them shorter than the earlier King Edward VII-class battleships and rather cramped in service, but the requirements also made the ships both flat-sided and fairly flat-bottomed; this and the mounting of the heavy 9.2 inch guns and their turrets had the useful side-effect of making the Lord Nelsons resistant to rolling and therefore both good seaboats and good gun platforms. However, the design also forced a compromises in the 9.2-inch battery. The ships' beam limitations forced abandonment of a design in which each of them would mount twelve 9.2 inch guns in six twin turrets, and instead they mounted ten of the guns in four twin and two single turrets, and limitations on the size of the 9.2-inch turrets themselves meant that they were cramped enough in service to impair the rate of fire of their guns. They were the last British battleships to have reciprocating engines and the last with twin propellers, future classes having turbines and four propellers. They also were the last with inward-turning screws, which allowed greater propulsive force and slightly higher speeds and slightly less fuel consumption, but were unpopular in service because they made ships less manoeuvrable at low speeds or when going astern. It was decided to stop using mixed boiler types in the same ship, and both had 15 uniform, large water-tube boilers, Babcock & Wilcox in Lord Nelson and Yarrow in Agamemnon. Although primarily coal-powered, they were the first British battleships designed to carry oil, earlier ships having been retrofitted to carry oil; Lord Nelson had six oil sprayers and Agamemnon five, and the use of these extended their range considerably. The boiler arrangements were very successful in service, and both ships easily made their design speed of 18 knots (33.33 km/h); on trials Lord Nelson made 18.7 knots (34.6 km/h) and Agamemnon made 18.5 knots (34.25 km/h). Agamemnon fires her 9.2-inch guns at Ottoman forts at Sedd el Bahr on 4 March 1915. The Lord Nelsons were the last British battleships to have an armoured ram built into their bow. They cost just over £1,600,000 each, the 2005 equivalent of about £110,000,000. The ships as completed were homely but intimidating in appearance, and looked more like French battleships than the previous British pre-dreadnought pattern. Lord Nelson and Agamemnon on patrol in the Dardanelles in 1915. Both ships commissioned in 1908 and served in the Home Fleet until World War I broke out in August 1914. After early wartime service in the Channel Fleet, both spent the rest of the war in the Mediterranean, where they were involved in attacks on Turkish forts and support of landings in the Dardanelles Campaign and later blockaded the German battlecruiser Goeben off the Dardanelles, although both were out of position and missed her when she sortied in January 1918. In November 1918 both ships were part of the first British squadron to pass through the Dardanelles after the Armistice. Agamemnon was employed as a radio-controlled target ship during the 1920s. Lord Nelson was laid down by Palmers Shipbuilding and Iron Company at Jarrow in 1905, launched in 1906, and completed in 1908. She commissioned in reserve in 1908, the last British pre-dreadnought to join the fleet, then served in the Home Fleet (1909–1914). Her World War I service was in the Channel Fleet (1914–1915), Dardanelles Campaign (1915–1916), Eastern Mediterranean Squadron (1916–1917), and Aegean Squadron (1917–1919). She went into reserve in 1919 and was sold for scrapping in 1920. Agamemnon was laid down by William Beardmore and Company at Dalmuir in 1905, launched in 1906, and completed in 1908. She served in the Home Fleet (1908–1914). Her World War I service was in the Channel Fleet (1914–1915), Dardanelles Campaign (1915–1916), Eastern Mediterranean Squadron (1916–1917), and Aegean Squadron (1917–1919). She went into reserve in 1919, then served as a radio-controlled target ship (1921–1926). The last surviving British pre-dreadnought, she was sold for scrapping in 1927. The two Lord Nelson class ships spent their peacetime career with the Home Fleet. In 1913 they temporarily joined the 4th Battle Squadron of dreadnought battleships. In the period before the outbreak of the First World War, Agamemnon was still with that squadron, but at the start of the war she joined Lord Nelson in the Channel Fleet. Lord Nelson was the flagship of Admiral Sir Cecil Burney, while Agamemnon formed part of the 5th Battle Squadron. In this capacity they helped to protect the BEF as it crossed the channel to France. At the start of 1915 both ships were still with the Channel Fleet, but it was then decided to send Agamemnon to join the fleet off the Dardanelles. The most powerful member of that fleet, HMS Queen Elizabeth, was then damaged in an accident that reduced her speed, and Lord Nelson was dispatched as well. Agamemnon set sail on 9 February 1915, and Lord Nelson on 15 February. Agamemnon actually arrived at the Dardanelles during the first bombardment of the forts, on 19 February, joining in the attack. She also took part in the bombardment of 25 February. By the start of March Lord Nelson had also arrived at the Dardanelles, and the two ships were placed together to form the 2nd sub-division of Division 1 of the battleship fleet. Both ships supported the landings of 4 March and the naval bombardment of 6 March. On 7 March they were sent inside the straits to bombard the forts. During this attack, Agamemnon was hit by a 14in shell, which penetrated the quarter deck, wrecked the ward room and the gun room below it, and sent splinters from the deck armour into the maintop 100 yards above. Another shot sent splinters into the conning tower of Lord Nelson, wounding Captain McClintock in the head. During the attack Agamemnon was hit eight times by heavy shells and Lord Nelson seven times, but despite this only slight wounds were inflicted on the crew. For the attack on the narrows on 18 March, the two ships formed the 2nd Sub Division of the First Division of the fleet. The First Division was first to enter the straits, bombarding the Turkish forts from long range. The next squadron of four French battleships then passed through the gaps in their line to bombard the forts from closer range. The attack began to go wrong when the French ships were withdrawing from the straits. The battleship Bouvet hit a mine and sank with the loss of most of her crew. Three of the British battleships involved were also hit, with two of them sinking. Agamemnon and Lord Nelson survived largely unscathed, although Agamemnon was hit by twelve 6in howitzer shells during the attack. Both ships supported the Gallipoli landings of 25 April. Lord Nelson was part of the First Squadron, supporting the landings at the tip of the peninsula. Agamemnon was part of the Fifth Squadron, containing destroyers and minesweepers. Her job was to protect those ships as they operated inside the straits. After the evacuation of Gallipoli, both ships remained in the Mediterranean. In January 1917 all other British battleships were returned home so that their crews could be used to man new destroyers and cruisers. They spent most of the war at either Mudros, guarding against a possible breakout by the Turkish battlecruiser Yavuz Sultan Selim, or at Salonika, supporting the Allied forces in the Balkans. On 12 January 1918 Rear Admiral Hayes-Sadler raised his flag in Lord Nelson, and four days later he sailed in her to Salonika to confer with General Milne. Agamemnon was at Mudros. On 20 January Yavuz Sultan Selim, accompanied by the light cruiser Midilli finally made their long-awaited sortie. They were steaming towards Mudros, and a clash with Agamemnon when they both hit mines. Yavuz escaped back to safety, but Midilli was lost. The Turkish Armistice agreement was signed onboard Agamemnon. The two ships then passed through the Dardanelles to Constantinople. Agamemnon then returned home, while Lord Nelson spent a short time in the Black Sea. After the war the pre-dreadnought battleships were no longer needed. Lord Nelson was sold for scrapping in 1920 while Agamemnon survived as a radio-controlled target ship until 1927. ^ Many sources say Agamemnon served as a radio-controlled target ship only from 1923 to 1926, but Burt, p. 295, specifically states she was converted in 1921 and provides examples of her service as a target ship in 1921. Per Burt, p. 298, she underwent a refit in 1922–1923 while serving as a target ship, and the confusion may arise there. Burt, R. A. (1988). British Battleships 1889–1904. Annapolis, MD: Naval Institute Press. ISBN 0-87021-061-0. McBride, Keith (2005). "Lord Nelson and Agamemnon". In Jordan, John (ed.). Warship 2005. London: Conway. pp. 66–72. ISBN 1-84486-003-5. Wikimedia Commons has media related to Lord Nelson class battleship.